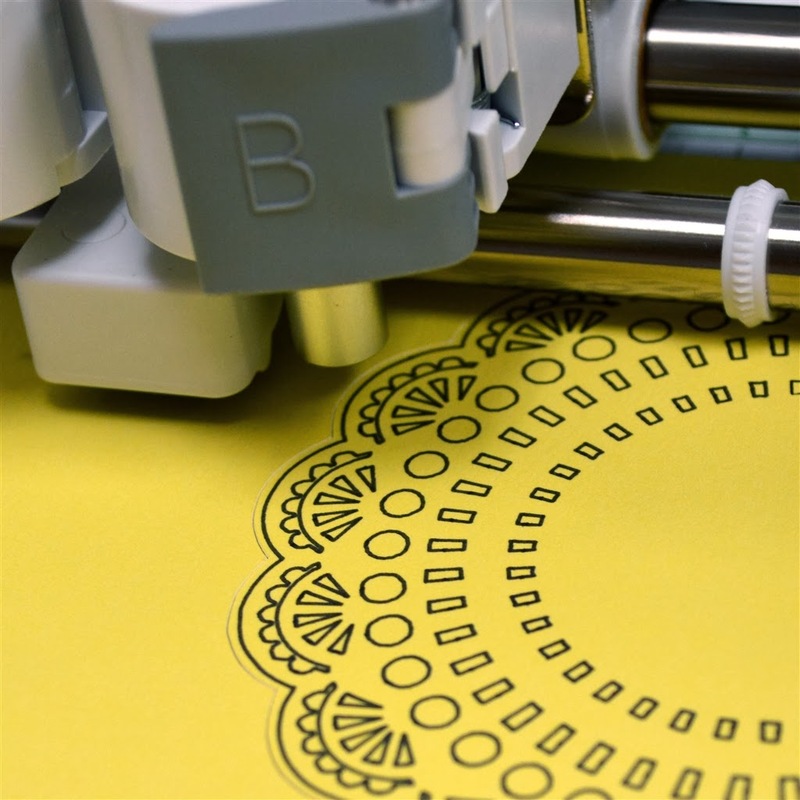 We have a lot going on this weekend and all I want to do is to try cutting the most intricate shapes I can find on my new Cricut Explore. Nearly everything that I have tried has cut perfectly the first time with no stress over settings. It is fun to have the subscription access which allows you to see and cut many images, including some that are only sold as digital sets. 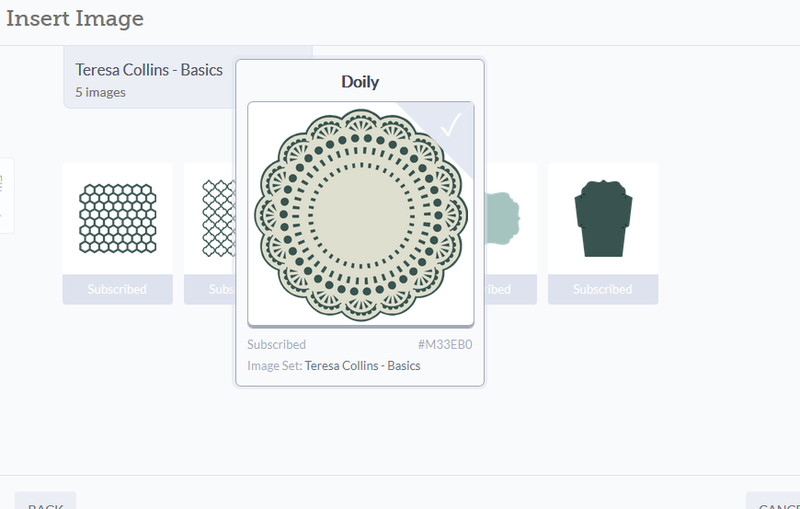 I spotted this doily in the Teresa Collins Basics set and thought "Hmmm, more small circles, tiny lines and even tinier pie shape cuts - how small can this go?" 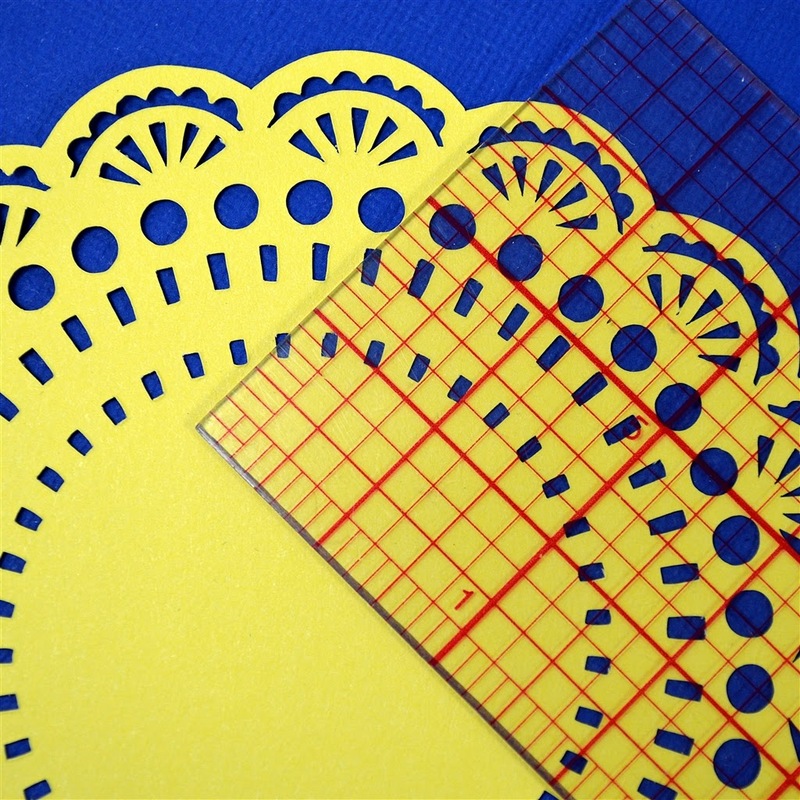 This cut has three layers - two are simple blackout backgrounds but the top doily is very intricate. Since the basket design had cut so well on Friday, I had great confidence that this machine would handle the cut. I sized the cut at a little over 3 1/2 inches, loaded the mat, used the cardstock setting and pushed cut. The cardstock I used is from Close To My Heart. I'd say it is a medium weight, nice and sturdy but not too thick. 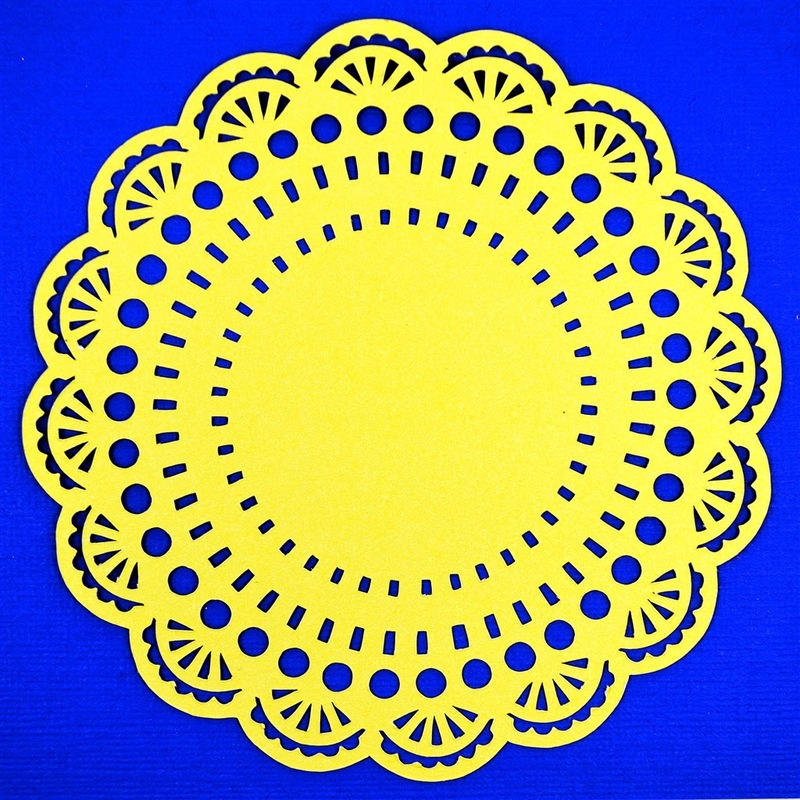 Here is how the doily looked on the mat after cutting. I have been very impressed by the quality of the cuts. They seem to be more complete and very few "hanging chads" get caught in the design. You can see that nearly all of the tiny bits stayed on the mat - that only happens if the cuts are complete. I have spent plenty of time poking out tiny pieces on die cuts made by earlier machines. There were just a few bits that I had to brush off the cut and none of them required the delicate loosening to break the sections free that you usually have to do with the older machines. The dime will show you just how small these cuts are - the little rectangles are just as impressive as the circles. All of those little rectangles have sharp corners. 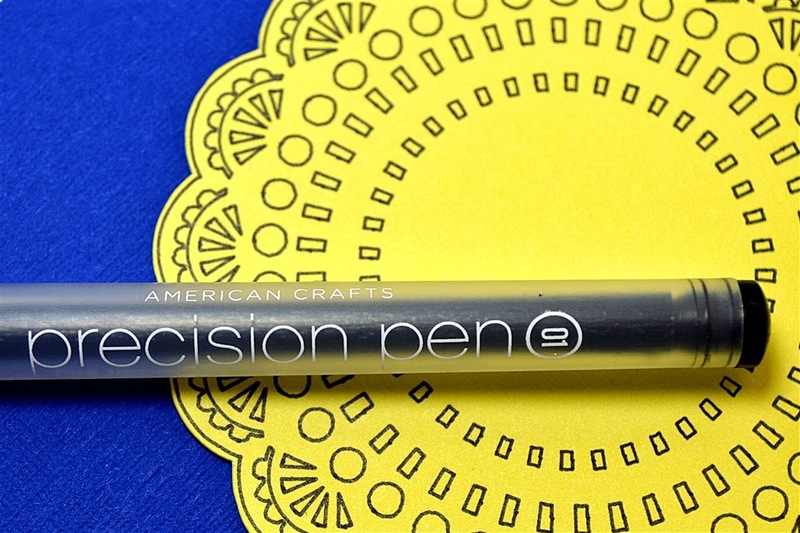 You can see from this gridded ruler that the circles (perfect again - thank you Cricut!) are about 1/8th inch in diameter. The next thing I decided to try was to draw the doily shape with all of the fine details and cut around the edges. I did not get to order a set of pens or the scoring tool when I ordered my machine (they sold out very quickly). At any rate, the pens in that set look to be the same width tip as the pen that comes in the box. I did the suggested sample project of a drawn and cut Thank You card on Friday when I got my machine set up. The pen in the box is silver and it draws very nice lines but I wanted thin lines. 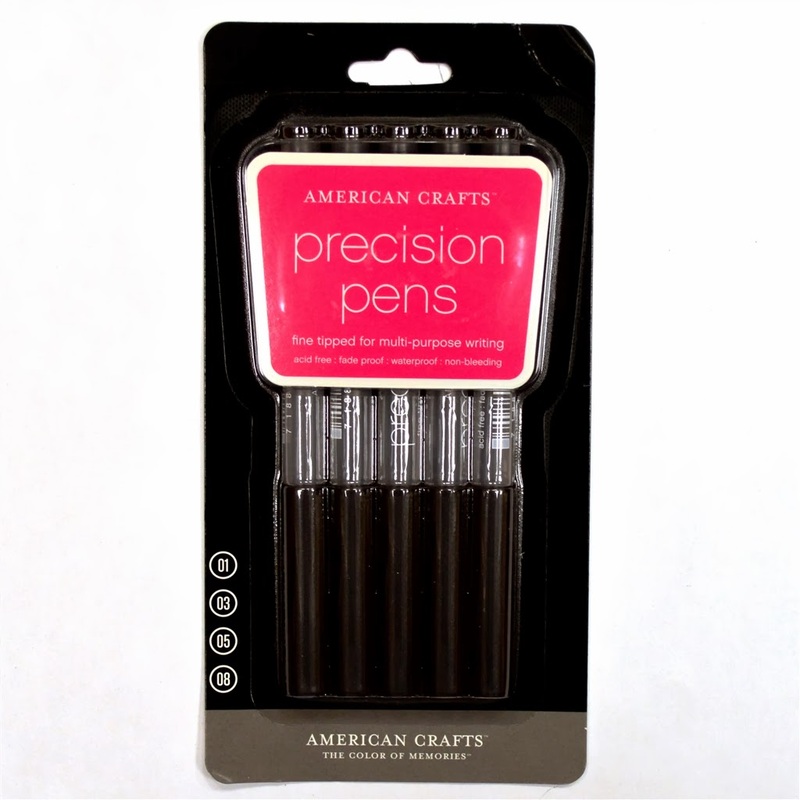 I stopped at the craft store and bought a set of these American Crafts Precision Pens (the Explore tag line is "Easy. Precise. Versatile. "and I wanted a thin precise line). These pens are exactly the same size and shape as the pen that came with the machine. They appear to be made by the same manufacturer and they fit in the accessory section of the carriage perfectly. I needed to change the doily shape to draw instead of cut. To do this, you click on the image you are working with in the layers panel and a menu flies out to the left. This is also where you change color (I hope they add a full range of colors with a color picker - this palette is very limiting). You just click on "Write" to change the lines from a cut line to a drawn line. The doily has two mats. I hid the larger bottom mat by closing the little eyeball to the right of the image in the Layers bar. The doily itself was set to draw and then I made sure that the center layer, the mat that is just a bit larger than the doily, was centered with the doily by moving it until it looked right. (This is another feature that I find missing in the software, there are no alignment tools and they certainly would be handy!). The next important step to keep the two images centered and together is to "attach" them. You do this by selecting both images and then right clicking and choosing "attach" from the drop down menu. "Attach" will keep the drawn shape and the background layer together so they will remain aligned as the design is first cut and then drawn. If you "Group" the images together, they will go to different mats for cutting and the position will be at the top left default so your cut line will not frame the drawn shape. The pen, in the "A" or' Accessory" carriage, drew this design perfectly. Next, the blade in the "B" carriage cut a perfect line just a tiny bit away from the outer drawn line. The precision is remarkable. If the Print, then Cut feature that is supposed to be added later this year is this good, I will probably be using this machine for almost all of my projects. Here is a closer view of the pen I used. It is the finest line pen in the pack - the "01" size. This will be fabulous for "handwritten" journaling on pages you design with the Explore and also for sentiments on cards. One of the things I really like about the dual carriage is that it solves the problem of accidentally getting a mark on your paper when you are switching between pen and blade. 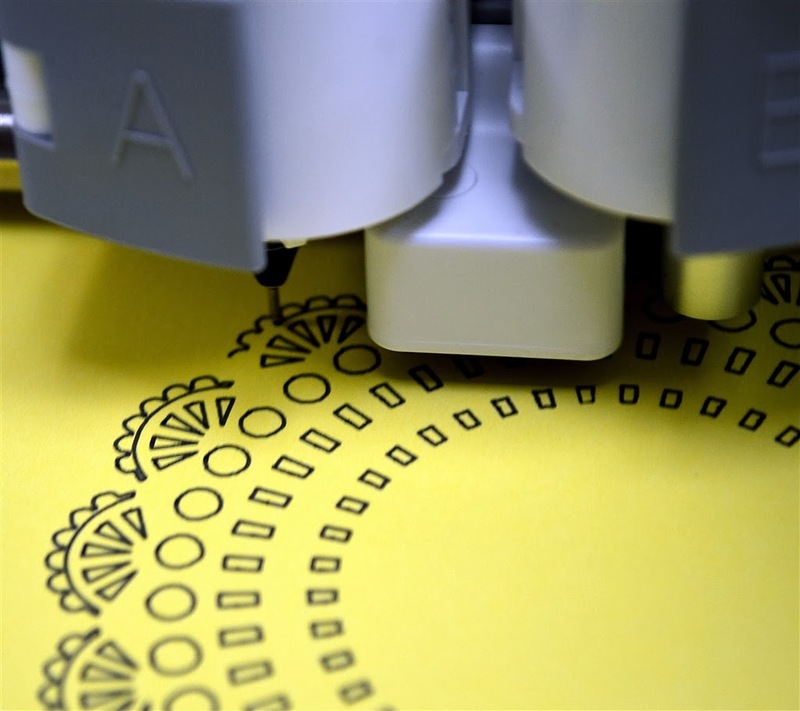 With this system, you install the pen before you have a mat in the machine (you could put a piece of scrap paper down to project the machine itself from an accidental mark when you are inserting the pen). There is also no worry about bumping the carriage and messing up the alignment during the switch - you just press go and both the drawing and the cutting happen in the same session. I also like the idea of using the metallic pens for writing on tags and labels. I have done a lot of print and cut labels but my home printer can't produce a true metallic shine. The possibilities are mind boggling when you start to think about ways to combine the printing and cutting of the images. 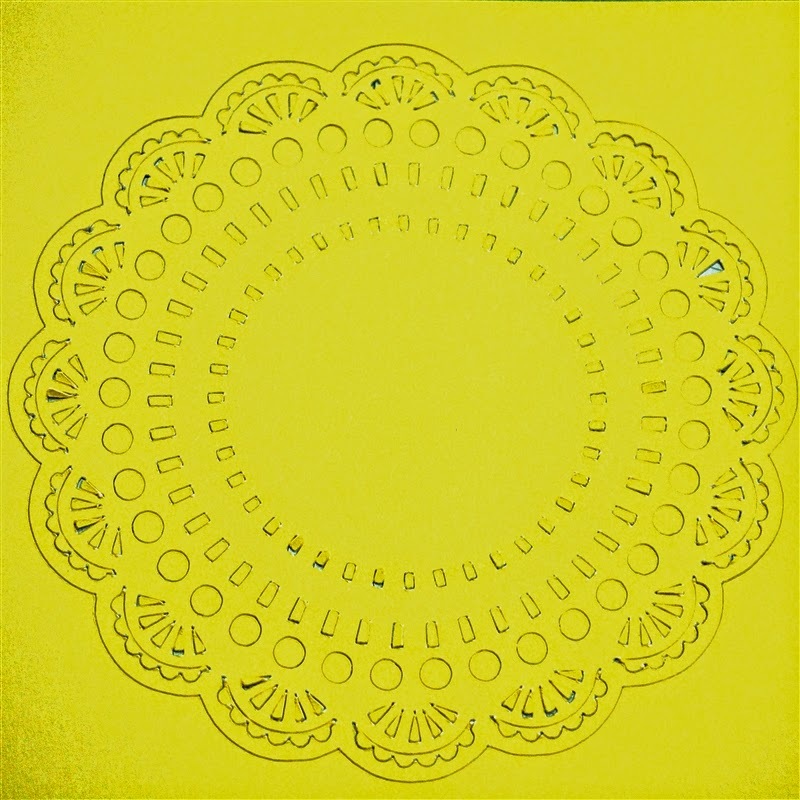 Here is one more look at the cut doily - it's truly amazing! 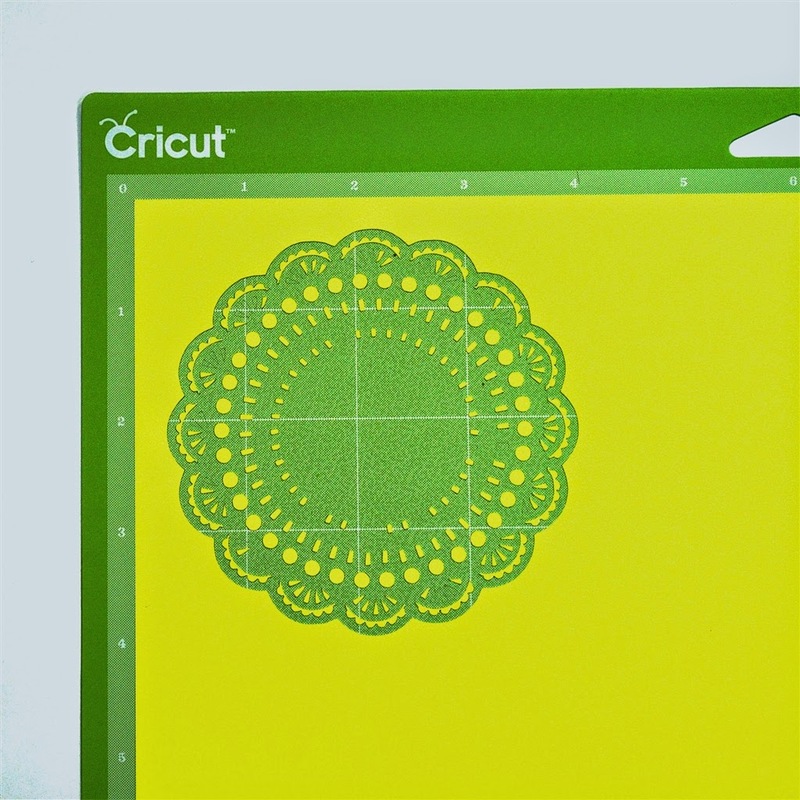 ***Note Added June 8, 2014 - there are a number of great Cricut Explore bundles available this week on the Cricut website - you can find them HERE (these are affiliate links). This afternoon I'll be cutting the scalloped shapes I promised to put in each of the three Blog Anniversary Boxes - oh, and also drawing the winners. Good luck to everyone - and if you don't win this time, stay tuned for a few other giveaways I'll be offering this month. Enjoy the rest of your weekend. I hope you get a chance to do something crafty! Thank you for always sharing what you figure out with new programs. Wow! I'm pretty impressed with the cut of that doily. The "print and cut" feature is also a great asset. 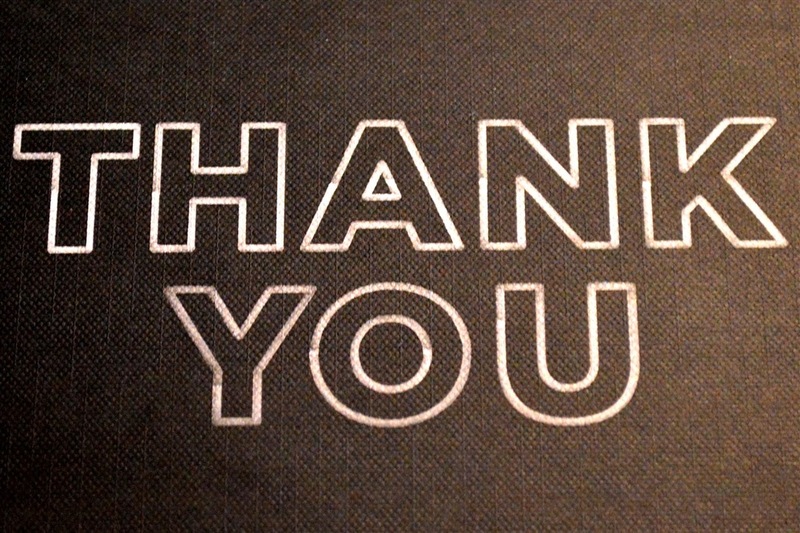 Thanks so much for showing your readers how well the Explore handles such an intricate cut/print. 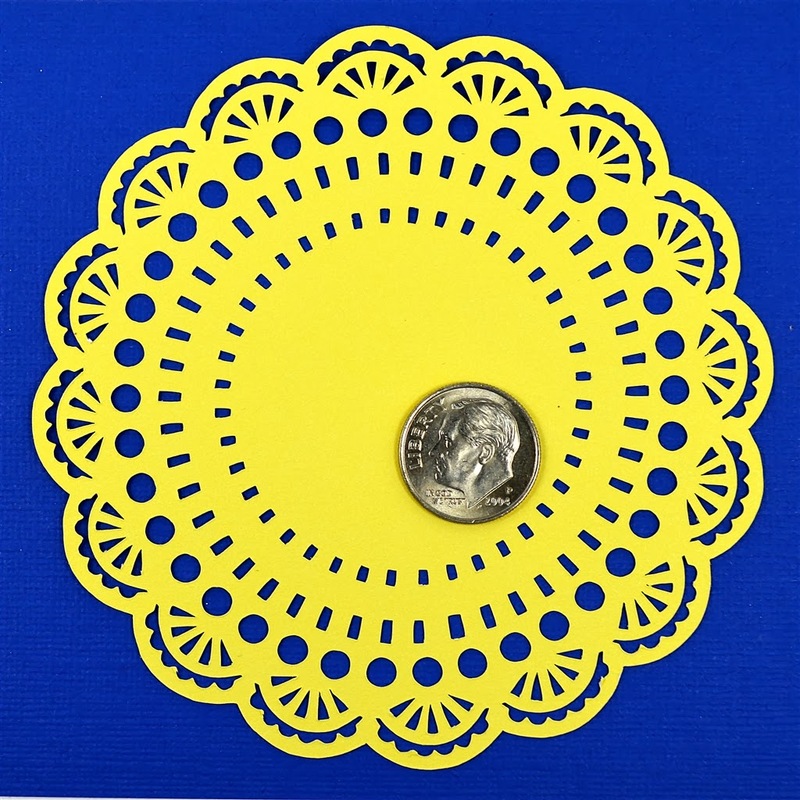 First, I really like the Theresa Collins Doily die cut. I am very impressed with the way the Explorer cut the intricate details. I have cricut expression and silhouette cameo, so I am still trying to decide on what to do. Thank you for taking the time to share your experiences with the Explorer. Thank you for sharing this, it looks as if Provo Craft has worked hard to meet the requests of it's customers! Your cuts look amazing, thank you for sharing this and Happy Sunday! Thank you for sharing all the details! It is very helpful to have the details with the cuts. Thanks. So far, looking good. Lack of an alignment option seems odd for design software. You are doing an amazing job of testing the limits of this machine. Thank you so much for sharing with us. Wow smart to look at different pens to use.... do you know if any of the precision lines would work or only the .01? I love some of their other colors but they are not in the .01. Thanks for sharing!! I am thisclose to ordering it and seeing this cut I just may have to get it. LOL Thanks again! I love all of posts about the new machine, but I'm still not sold. I love my Cameo and am not ready to switch back to Cricut. Thanks so much for sharing your thoughts on this new machine. I so wish I had a dependable internet so I could use it. I love the pen/score feature with the new Explore. If you had done the demo on HSN, they would have sold out even faster. Thanks again for the detail you share with all the at-home crafters. I spent several hours with my Expression yesterday cutting out decorations to hang from the patio ceiling for a 90th birthday party for my mom in June. Thanks for another tutorial on the Explore. I'm still on the fence but you make it more tempting. Fabulous! Can't wait to see what projects you create with the Explore and its intricate cutting capability! Thank you for the great review. Too bad there isn't a Color picker. I was hoping for RGB selections. Hopefully down the road! The doily does look great. I'm looking forward to seeing more as time goes on. This looks amazing, and you are really showing us the full capabilities of the new machine. I may "need" to get one of these for my birthday! LOL. OMGosh, that is amazing. Wow Wow Wow. Last night I was cutting very small letters for a sentiment and am not happy at all with the way they turned out..on my older machine..I have been playing around with the Cricut Design Studio and I feel like all thumbs. I can see where the subscription allows you access to so many more cuts. So excited for you and your new toy. Saving for my new toy. Now you know I will be checking back several times today to see the names of the lucky winners. Wow, very nice. Thanks for all these tutorials and advice. Thanks, Diane, so far, so good. You must be having so much fun! Shocking there's no align tool, that's disappointing, I use that a lot on the Cameo, especially when doing Print & Cut. Hopefully,PC can add that along with the print and cut and the color picker and RGB color range. The cuts you've shown are really beautiful and well cut. Thank you for the tip on the pens, I'll order those now so I'll be ready when my machine arrives. I'm on the HSN list to be notified when the Cricut pens are available. I really appreciate your sharing all this great information with all of us, it should really help get a jump on the Explore learning curve. Thank you, thank you for being our crafting partner! Awesome! Thanks for posting this...it looks amazing. I can't wait to try this...I will refer to this post when I try it... God bless! So glad to have found you, thanks so much for this great info. I would love to see this machine in action. Thanks for sharing all of its greatness. Now I know I must have an Explore. Thanks for showing the intricate details of this machine. Thanks Joan - it really is an amazing machine and I can't wait to see what they add with more updates. Happy to see you here (and I love the expression "all that and a bag of chips")! 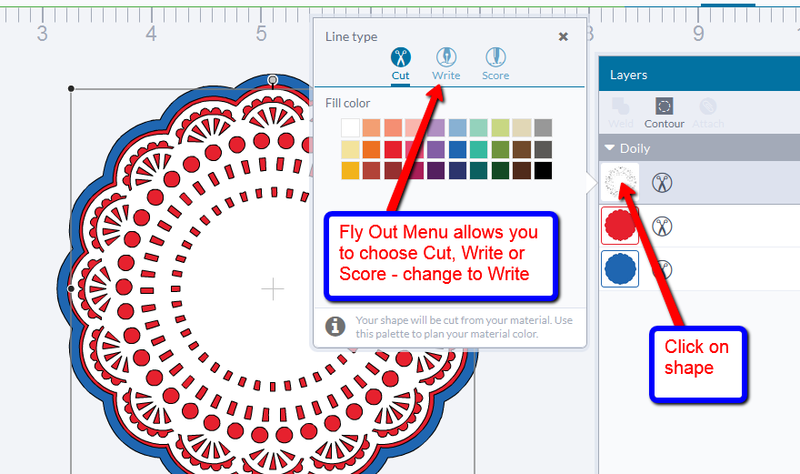 I purchased my cricut explore about two months ago, apart from minor glitches (sometimes caused by windows 8) quickly solved by the wonderful problem solving staff, I am having a great time with it. Still would like to learn how to make my own SVG's but the jpeg's work well. I invested in a deep cut knife and blade and have been happily cutting out stencils all day. All came out beautifully, I used a new mat and hardly had to poke anything out - possibly if I had smoothed the stencil before I took it off the board more bits might have clung to the sticky new board. Also cut a complicated flower pattern with no problems. I think I might be using the wrong setting for card stock as there were cut marks on the mat, so I have switched to a mark midway between card stock and light card stock an that seemed to work. Do you sell or reccomend anything to re-sticky a board. My friend was impressed when she asked me to cut some lightning bolts for something she was making for her grandson and planned to write on them till I showed her that the cricut could do that too. Lol. Hi - I am happy to hear that you are having a lot of fun with your Explore. It is normal for there to be a few marks on the mat from the cuts but it saves wear and tear to use the lowest setting that you can and still get a clean cut. You may have to do a little trial and error for particular papers or cardstock brands that you use. That said, I have used "cardstock" for a lot of different brands and types of paper and they all have cut well. To make your mat sticky again, try washing it off to get rid of paper lint. Just mild dish soap under running water is fine - don't scrub it hard, just lightly is enough. Then shake it and leave it to air dry. Eventually, this will stop working and there are various ways to "resticky" the mat. I have used the wide Zig two-way glue pen. You apply a light even coat and let it dry - be sure it is good and dry because the adhesive is permanent if you apply the paper while it is still wet. I would let the mat sit overnight. Some people also use repositionable spray adhesives but you need to be careful to tape off the edges of the mat if you do that. If you keep the mat clean it will last a long time and I usually just buy more mats when mine are worn out. I'm really enjoying all your Cricut Explore postings, I find them so useful and informative. I've just used mine this past weekend (though I've designed many projects I just did my first cut). In regards to the alignment of your layers I found on the "Edit" window/tab at the bottom if you make sure both layers placement match that'll line them up to each other perfectly. I believe for the vertical & horizontal placements they're listed as X & Y, I used this for a project that I had several images that I needed to ungroup to delete an unwanted layer and for visual purposes they needed to align to each other along with their layers. Looking forward to more postings! Thanks Linda - I am glad to know that my posts are helping you. I know that you can use the "X and Y' coordinates to align things but this can be tedious (and involves a lot of subtracting and dividing to find the right numbers!) Most graphics programs that I have used have little icons for aligning center, top, middle, left, right - it is these shortcut buttons that I am hoping they will add. Have a lot of fun cutting all of the things you have designed.